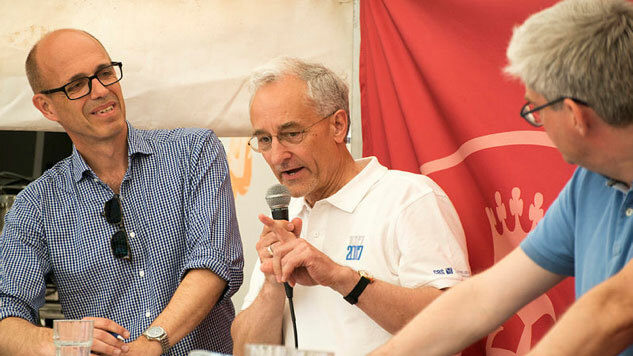 Photo: President, CBS, Per Holten-Andersen at People's Political Festival 2017. Over four rounds, Danish newspaper Politiken and The Danish Center for Research on Women and Gender invite to a discussion about “Colourless feminism - why is feminism considered a left-wing project?” and “Man’s fight for liberation - is there something in the opinion that ‘women have won’ and that equal opportunities now is men’s fight for liberation?” The panellists are Per Holten-Andersen, President, CBS, Ditte Giese, Politiken, Louise Kjølsen, twerkqueen and psychologist, Stine Bosse, The Danish European Movement, Henning Thiesen, DJØF, Dennis Nørmark, writer and anthropologist, Saman Atter Motlagh, psychologist, and Mette Davidsen-Nielsen from Politiken as moderator. Join the debate and help solve minor and major problems at the universities. Panellists include Tommy Ahlers, Minister for Higher Education and Science, Per Holten-Andersen, President, CBS, Anders Bjarklev, rector, DTU, Henrik C. Wegener, rector, KU, Jacob Mark, member of the Danish Folketing for the Danish Socialist Party, Henrik Dahl, member of the Danish Folketing for Liberal Alliance, Pernille Schnoor, member of the Danish Folketing for The Alternative, and Mads Steffensen, TV and radio host and moderator. Every 5 student do not see a reason why they should learn more than what they need for their exams, a survey from the Danish Evaluation Institute (2018) shows. Students of today are far more goal-oriented than ever and the massive focus on speed and progress affects study culture for better or for worse. Have we as a society gone too far in our eagerness to rush students through school? Or is this reasonable, now that the programmes are publicly funded? Per Holten-Andersen, President, CBS, are among the panellists. Are we ready for the labour market of the future? How do we prepare our students best for a labour market influenced more and more by digitalisation and automation? This question will be addressed in a debate about the labour market of the future, including Per Holten-Andersen, President, CBS. Other debaters are Kim Simonsen, Chairman of HK Denmark, Mads Eriksen, head of education and research policy in the Confederation of Danish Industry, and Christine Sørensen, Head of Policy Denmark and Norway at Google. Mentor schemes have gained more popularity in Denmark, but how can voluntary mentors contribute to the social as well as the education area? This will be debated by Benny Andersen, chairman of the national union of social educationists, Jannik Schack, head of policy for the think tank DEA, Lars Brittain, network head at DJØF, Anders La Cour, researcher in voluntariness at CBS, Luna Lindén, voluntary mentor at Learn for Life and Stine Hamburger, head of programme of voluntariness, Learn for Life. Join a debate focused on collaboration and joint responsibility for lifelong learning. This is essential in a time where robots, artificial intelligence and digitalisation are going to replace many jobs. This issue will be discussed by Tine Rod, Director, Confederation of Danish Industry, Lars Nørby Johansen, chairman of the board, Syddansk Universitet, Majken Schultz, Professor, CBS, and Per Falholt, chairman of the board, DTU. Is there a new opening for the OPP market in Denmark? Professors at CBS Christina D. Tvarnø and Carsten Greve will discuss how OPP infrastructure projects can create value. Other participants: Jakob Scharff, PP industry sector executive, Confederation of Danish Industry, and Marius Møller, Director, Pension Denmark. Jacob Fuglsang, journalist, Politiken, is moderating the debate. Join a combined debate and workshop focused on encouraging more men to take paternity leave. This can be a unique investment for a family but also society. The topic will be debated by Signe Gro Jensen, HR Director, Deloitte, Lisbeth Odgaard Madsen, Founder, Potential Company, Lotte Hjortlund Andersen, Director, ISS, Henrik Funder, Chairman of DJØF Privat, Anders Lauesen, Head of HR, CBS and Henriette Højbjerg, Head of Secretariat, DareGender. Ole Bjerg, Professor at CBS and Chairman of the board in Gode Penge, will in his presentation compare new types of money such as e-kroner and Bitcoins with old-fashioned physical money. How can we ensure even more socio-economic companies that can create new possibilities for vulnerable people on the labour market? This topic will be debated by Katja Isa Sørensen, Research Assistant, CBS, and Christina Grøntved, Director, Incita. The debate will be moderated by John Krog, industry sector executive, Selveje Denmark. The debate about neo-liberalism moves from the paper to the Political Festival, when Niels Fuglsang, PhD Fellow at CBS and Jonas Herby, Senior Advisor, CEPOS, discuss their different views on neo-liberalism. Chief Editor at Information, Rune Lykkeberg, will moderate the debate. Data-informed management: death by drowning or lifeline? How can managers use better data in practice on how citizens can benefit from public efforts? Participants will be: Jens Folman, Kalundborg Municipality, Helle Riis, Social Educators, Anders Fløjborg, Danish social workers, Karin Termannsen, HK local and Anders Raastrup Kristensen, management expert at CBS. 10 minutes of research dissemination. Three top researchers must observe this rule when they compete to win the vote of the audience The participating researchers are: Niels Fuglsang, PhD Fellow, CBS, Rebecca Adler-Nissen, Professor, KU and Lene Lange, Professor, DTU. Stand-up comedian Lasse Rimmer will moderate the science slam. Where is the EU heading in light of Brexit? The UK is leaving the EU. On this occasion the debate will take its point of departure in how we ensure impact and equal terms across borders. Participants are: Mette Walsted Vestergaard, journalist, Per Bremer Rasmussen, CEO, Forsikring & Pension, Ole Helmersen, Associate Professor and UK expert, CBS, and Martin Lidegaard, former minister of foreign affairs, Danish Social-Liberals. Listen to the dialogue: Do you believe in Generation World Goal? The 17th UN World Goal is in focus. This debate is focused on whether the Danish education system is geared for the preparation of Generation World Goal. And what does it take to improve the system. Participants are Jørgen Nørby, Region Midtjylland, Rikke Villumsen, Randersgade Skole, Nadja Enggaard Lausen, Odense Katedralskole, Sarah Louise Muhr, Professor, CBS, Steen Hildebrandt, author and speaker, Sana Mahin Doost, Danske studerendes fællesråd and Thomas Ravn-Pedersen, Verdens bedste nyheder. Civil society and voluntariness are central topics in the discussion of the Danish welfare state of the future. Join a debate about the future role and organisation of civil society. Participants will be: Lars Bo Kaspersen, Professor, CBS, Anne Lise Marstrand-Jørgensen, author and spokesperson of Venligboerne in Greater Copenhagen, Trine Bendix Knudsen, head of secretariat, Dansk Folkeoplysnings Samråd and Christiane Mossin, postdoc, CBS. Corporate sector democracy - why and when? Can a democratic corporate sector grow from the bottom (again) - or do we need legislation? The panellists are: Anders Møller Mulvad, Assistant Professor, CBS, Christoph Houman Ellersgaard, Assistant Professor, CBS, Anton Grau Larsen, Assistant Professor, CBS, Magnus Skovrind Pedersen, member of secretariat, Demokratisk Erhverv and Lars Bo Kaspersen, Professor, CBS. Learn more about how the public and private sectors meet across industries to find solutions to sexual harassment of woment in the workplace. Christina D. Tvarnø, Professor, CBS, and Sara Louise Muhr, Associate Professor, CBS, kick off the debate. Other participants are Anne-Mette Ravn, CEO, Hartmanns A/S, Louise Dinesen, chief psychologist, Hartmanns A/S, and Hanne Nyström, organisational consultant, Hartmanns A/S. How much can you make on welfare? Media house Den Offentlige invites to a debate about the concept of profit. How much can you make on welfare and who makes most money? Ole Bjerg, Associate Professor at CBS, will join this debate. Municipal poetry - do we have special paradigms in welfare? What do we know about contestability of municipal welfare? And what goes on at markets? This will be discussed by Carsten Greve, Professor, CBS, Claus Thykjær, administrative head of Greve Municipality, Kurt Bardeleben, lawyer and partner in DLA-Piper, Steen Houmark, CEO and author of ’The municipal Bermuda Triangle’, Maria Elverhøj, Quick Care, and Miriam Toft, CEO, Aleris Care. Are the Ministry of Finance's computational models reliable? This debate is about the computational models of the Finance Ministry, which have been subject to criticism in the past years. Where do they come from? How have they developed? Which part to they play in Danish politics? And are they at all reliable? This topic will be discussed by Niels Fuglsang, Ph D Fellow, CBS, Hanne Pontoppidan, chairman of Uddannelsesforbundet, Mogens Lykketoft, member and former president of the Danish Folketing, and Otto Brøns Petersen, CEPOS. Crypto-currency - ideology, gambling or the new normal? Join this debate and learn more about the heavily debated crypto-currencies, the technology behind and what they mean to the financial sector of the future and you as a citizen. The panellists are Ole Bjerg, Associate Professor, CBS, Peter Nyholm, InsideBusiness, Tanja Lind Melskens, attorney to the Government, and Steen Lund Olsen, The Danish Financial Services Union. That is why Denmark needs e-kroner! Why it is a good idea to introduce digital e-kroner in Denmark? This debate will be about e-kroner, and Pelle Dragsted from the Danish Unity List will talk about their advantages. He is accompanied by Ole Bjerg, Associate Professor, CBS and member of the board of Gode Penge, who will present his arguments in favour of e-kroner and answer questions from the audience. Michael Schøt og Ole Bjerg: Why is nothing happening? Join an entertaining presentation with stand-up comedian Michael Schøt and Ole Bjerg, Associate Professor, CBS and member of the board of Gode Penge. They will talk about the three stages people are going through when thinking about the current monetary system in Denmark. The debate will answer the fundamental question: How come we do not already have a new monetary system? Reunion 1920 – a role model for Catalonia? Catalonia has expressed a wish for independence, which has lead to conflict between the central Spanish government and the Catalan regional government. This debate is about the conflict and explores how the Danish-German reunion in 1920 can inspire to a solution. The panellists are Christian Juhl, member of the Danish Folketing, Lukas Lausen, Chairman of U35, Anke Spoorendonk, European Free Alliance (EFA), and Uffe Østergaard, Professor Emeritus, CBS.